As a non profit organization, the Cape School of Art relies on contributions from individuals and businesses interested in our commitment to educating artists in perception and use of color and light in representational painting. 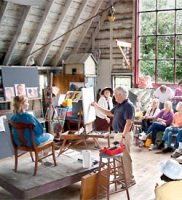 Through workshops, classes and lectures we seek to inform a new generation of artists, patrons, and visitors about the teaching and influence of American Impressionist Henry Hensche and his mentor, Charles Hawthorne, founder of Provincetown’s historic art colony and the original Cape School of Art in 1899. We have established a series of membership levels, use the links on this page to determine your level of support.